Are there certain signs that define whether someone has a walk in soul? What would you do if you recognized these signs? The energy that was measured at the Harmonic Convergence of 1987 proved that an acceptable percentage of humanity was ready to continue on a path of evolution through raising their consciousness. Those souls that have not evolved will eventually decide to leave the planet. They will do so either by leaving the body to be recycled into the planet or by allowing another soul to “walk in” to their body while they make the transition away from the current Earth experience. As Earth moves astrologically into the Age of Aquarius, it also moves through a complete cycle of the out-breath of Brahma, or cycle of life. The return to Source is beginning now as the in-breath or expansion of light occurs after being constricted and seemingly cut off from Source. As the planet also expands with light, it creates an opportunity for soul growth that is extraordinary. Many souls stood in line for a chance at an incarnation, but there were only about 8 billion bodies available. There are some souls that came here for the growth, some souls that came here to make the soul growth happen through dissonant polarity, and some souls that had already experienced the Earth soul growth school and came “back” to assist others. As this cycle of life ends, Earth triggers a house cleaning in order to create the space for light. Some people finished what they came here to do on this lifetime and are ready to exit, along with those who did not evolve. There are a lot of people making this transition through leaving their physical bodies to return to the elements. However, because of the demand for a physical body at this time there has been an increase in walk-in souls taking over the physical body as another soul decides to leave. A great shift in consciousness is expected to happen in this lifetime, and there is not enough time for most of the experts that need to be here to incarnate the traditional way. Souls that have not evolved on a high enough level to make the transition on Earth are also making agreements on a soul level with those who have come here on a rapid evolution or special mission and they decide to trade places. All walk in experiences are pre-arranged by souls on the etheric level. The walk ins described here are for benevolent soul growth. Other malevolent experiences involve energy hitchhikers or overlays and are usually not part of the current walk in experience phenomena. A walk in inherits all of the prior soul’s agreements and contracts that have not been fulfilled or excused prior to the time of walking in. Most of the time a walk in does not have knowledge that an exchange has taken place until they begin to become spiritually aware and explore this possibility. Temporary walk in– If your soul is needed on another plane or world, a walk in soul can come in for a short term period of time to “hold the fort down” while the original soul takes care of business or receives healing. Soul exchange- This is the most difficult way to integrate. In order to allow a soul to completely exchange places, this experience often happens with an accident coupled with memory loss (amnesia). With this method, there is an excuse for the new soul that does not recognize their family or spouse. However, there is still a very small amount of soul particle left from the original soul on an as-needed basis for the walk in to rely upon to ease the transition into everyday tasks here on Earth like eating, talking, etc. Soul braiding– Since a full walk-in experience is very complex and confusing for the walk in and family alike, most souls plan to gradually introduce their energies into a body while the old soul gradually leaves. The old soul is considered the “caretaker” that helps integrate the walk in soul with daily life. A woman had to take a lot of her essence with her to her home planet in order to make decisions on a special counsel that was taking place. A male aspect on a very high level came in to her body here on Earth so she could leave. This exchange occurred on the airplane while she and her husband were going on a week long vacation in a tropical setting. This male walk in was fascinated with the woman’s body and decided to take full advantage of exploration. Whereas the old soul would have never worn a two piece bathing suit, the walk in bought two of them and probably could have purchased a bigger size overall. This was very uncharacteristic of the old soul, and she was quite embarrassed to see the vacation pictures afterward. The new soul also imbibed very much in alcohol, whereas the old soul did not drink much because of an alcohol intolerance. For those souls who do a permanent and immediate soul exchange, it is usually a tip off when an accident and/or amnesia occurs. Because of prior agreements and contracts that are inherited, the walk ins spend a period of integration getting to know their “new” family. The main difference is shown in the personality, as it can be completely different from the original soul. Soul braiding usually occurs over a period of time as the walk-in eases into the old soul’s life. The focus in life begins to shift to service to others and their mission usually becomes their primary focus, sometimes leading to obsession. 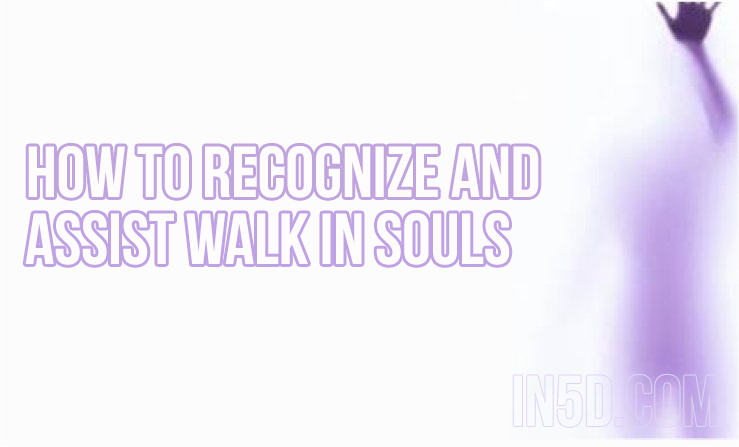 As more walk in soul essence comes in, they tend to see things from a higher consciousness and remember how to access their sixth sense abilities. In a soul braid, the two souls eventually begin to vibrate as one energy and usually the higher essence will gradually occupy the body more than the original soul as they prepare for a complete shift in consciousness. Many walk ins are purposefully connected to higher aspects of consciousness and quickly learn to bring information and light to humanity. They become healers and writers and/or speakers of spiritual, esoteric, and metaphysical topics in order to help humanity have the information necessary for the changes upon the planet at this time. As walk ins begin to bring more of their soul essence in, their short term memory may begin to show signs of failing as they switch back and forth between who they were five or ten minutes in the past. On a relationship level, it may become difficult to communicate with a person or to be around someone who has a different vibratory rate because of a walk in. This can either cause relationship problems between partners or it could also help the non walk in partner begin to vibrate at a higher frequency in order to coexist in a higher spiritual relationship. On a friendship level, many friends begin to fall away and new friends begin to be attracted. Walk ins come from various places, dimensions, vibratory levels, and categories. On a planetary level, a walk in could come in from the Pleiades, Sirius, Arcturus, etc. From a more integrated perspective, a walk in could be more of a conglomerate oversoul or monad category, and could actually be from the same monad as the old soul. From a hierarchical level, walk ins could be from the angelic realm or Christ consciousness, and are definitely here to assist the planet and her occupants into the higher realms. Many walk ins are soul family members that decided to give another soul a taste of the Earth experience. This type of arrangement is the easiest because they usually have other soul family members as a part of their Earth family, so the difference in vibration and recognition is not that much different. This soul family exchange may have a higher vibrational master come in at the beginning to set the stage or they may come in at the end to finish the job. Walk in souls are strangers in a strange land and need feedback and emotional support. Communication is often difficult but should be encouraged. Isolation often occurs with the walk in and extreme cases could even result in the “caged animal” syndrome. Allow the walk in soul to spend time alone as they adjust to unfamiliar sociological beliefs and customs. A walk in may feel a sense of anger from being trapped in an unfamiliar body and may need an outlet for that. An example of such an outlet is having a calm demeanor in every day life until one gets behind the wheel of a car, where road rage manifests. Recognizing the need for an outlet without judgment is helpful as the walk in continues to make the energy adjustments necessary. In The Four Agreements by Don Miguel Ruiz, one of the agreements you can follow is to not take anything personal in order to live from a higher perspective and consciousness in life. This agreement certainly comes into play while assisting a walk in soul. The walk in may not have as much tact as the old soul used to or may be so focused on their mission that they do not always remember to take other people’s feelings into account. Walk ins can also be the one to be overly sensitive. As discussed, most walk in souls come from a much higher vibratory rate than the old soul and have difficulty adjusting to the harshness of the reality of the extreme polarity at this time. This may cause one to be overly empathic and until the walk in learns protection against negative energies, it is wise to allow these energies to express and flow out of the walk in through the human emotional body. A walk in’s reward includes rapid soul evolution for taking on the extreme difficulty of adjusting to a human body out of service to humanity and Source. Many walk in souls have made a “career” out of going on special “recon” missions such as this one, and are very good at what they do. Few of these missions have been as difficult through the veil of forgetfulness that exists in the human body that they come into. The high risk job of a walk in is not the same as those who incarnate into this experience without having a clue as to what is happening. It is also different from the incarnated soul who is advanced enough to have less of a veil, allowing them soul memories of who they are and why they are here. Integrating into the “grey” area on Earth can be difficult and confusing but the experience is like no other in our Universe. Most all walk ins come from other dimensions or vibrations where the emotion of fear is not present. They come here to help transmute fear for humanity in order to help them move to a place of peace and love. Most walk ins ARE LOVE embodied and go through a rough period of not being love in order to raise the frequency of the planet from the bottom up. Walk ins will help humanity bridge the gap between the higher dimensions. The best support you can give a walk in is to match their unconditional love. Pets are a great way to make a walk in feel more comfortable and at home. Unless a walk in is aware they are a walk in, it may not be appropriate to say “I think you are a walk in”. This is no more effective than telling an “asleep” person “you need to wake up”. However, with articles such as this one and with various books on the market, walk ins will find the material they need to become more aware of what has happened. As the consciousness continues to rapidly rise on the planet, more people are realizing what the walk in experience entails and are coming together to form walk in soul group reunions. Just when you think you may have gotten used to a walk in soul braided with your companion, another switch may throw a kink in the rope. As conditions change on Earth, another type of walk in may be needed either temporarily or as a new soul braid. As long as there is an original agreement in place for you to work with the original soul or the first walk in, you will probably be able to work with the next walk in as well. Working with and assisting walk ins is one of the best tests of intergalactic readiness in advancement toward being a Galactic Ambassador on one’s soul evolution path. Do you think you’ve had a walk-in soul or do you know someone who has? If so, comment below! About the author: Michelle Walling is a Certified Holistic Life Coach. She has devoted her life to being a bearer and grounder of the light in service to others. As a truth seeker, she is committed to share her experiences with the world. She is also a hands-on healer, a distance healer, an empath, and an intuitive. Michelle is host of The Cosmic Awakening Show and webmaster/author/editor on CosmicStarseeds.